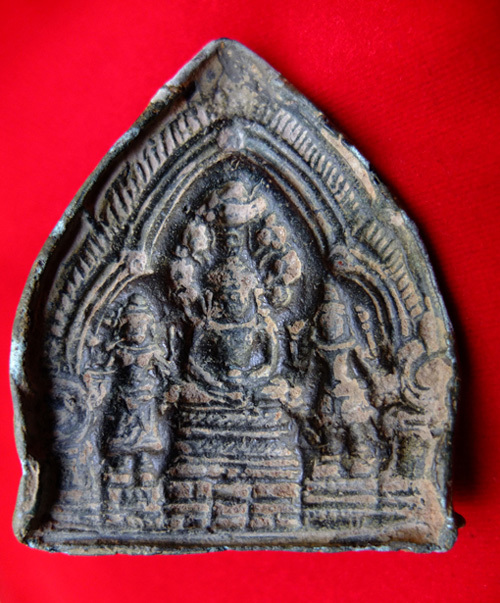 Description: This mould presents the 'triad Mahayana', the seated Buddha which is protected by the heads of Naga; Avalokiteshvara stands to his right and Prajnaparamita ('Perfection of Wisdom'; the feminine form of the Bodhisattva) stand at his left side. It is associated with the Mahayana Buddhism. Bunker, Emma C. & Latchford, Douglas. "Khmer Gold - Gift for the Gods." Chicago (USA): Art Media Resources, 2008, pp 82 "Buddhist Triad". Rooney, Dawn F. "Khmer Ceramics - Beauty and Meaning." Bangkok: ARiver Books, 2010, pp 135-137 "Mould for votive tablet".